I went along to a fabulous conference earlier this year, “Building Resilience and Wellbeing for Growth”. Organised by D2N2, there were around thirty exhibitors, the hall was packed, and the administration was first-class. The presentations were excellent and thought-provoking. Over the day, I connected and reconnected with several wellbeing therapists and coaches. “Is anyone interested in creating wellbeing through improving core work processes”? I was curious to know if anyone in the audience believed that effective work processes actually contribute to wellbeing. My experiences as a Continuous Improvement (CI) and Lean practitioner persuade me there are huge opportunities to leverage wellbeing through making the work work well. I didn’t get a big response to my question, and I wasn’t surprised, as the causal link is normally the other way round – that wellbeing helps to improve work, performance and productivity. So, I decided to write this blog to explain and explore the links between wellbeing and good work in the hope I can find therapists and practitioners who are interested in a more holistic approach. In the first flowchart, there are several management and supervisory interventions and checks. This not only slows down the flow of work, it indicates a lack of trust in the team, and disengages them. It runs the risk of escalating complaints as customers continue to receive confusing letters. Operational staff are in the firing line for complaints and abuse. They feel helpless and out of control. The second flowchart reflects the position after leaders and the team have been trained in Lean thinking (good work). This could include brainstorming, process mapping, collaborative working, and critical thinking skills. The process is more streamlined, there are fewer hand-offs to supervisors and leaders. Teambuilding, training and good leadership ensured the team collectively found a solution. Operational staff are acknowledged trusted and involved. They own the change. Following this Lean training, the team has not only resolved this issue, they know how to approach new issues in the future. Increased self-belief, trust, and empowerment follow. Collaborative, streamlined processes have reduced the team’s frustration and improved their wellbeing. What are others saying about wellbeing and productivity? The ONS Productivity report (updated July 2018) comments on the slowdown of economic growth against plans. 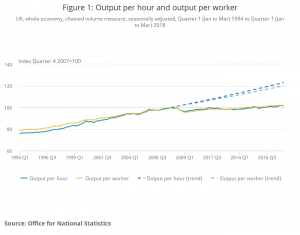 UK labour productivity in Quarter 1 (Jan to Mar 2018), as measured by output per hour, grew by 0.9% compared with the same quarter a year ago, however this growth remains below the 2% figure pre-2008, continuing the “productivity puzzle”. 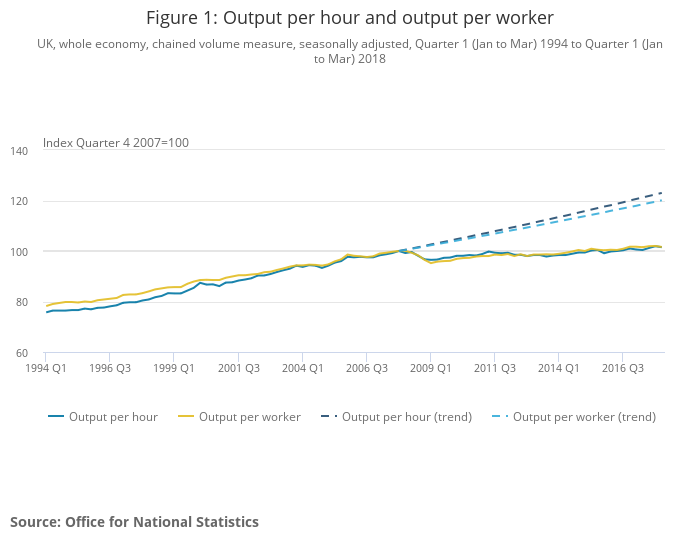 The ONS interprets the data in many ways, however the trend diagram below clearly shows a downturn in the productivity growth post-2008, which has not yet recovered. In this document there is no reference to a causal link from good work to wellbeing. In this report there is no reference to a causal link from good work to wellbeing. Chronologic states that the effect of employee wellbeing on productivity rates has long been suspected. Many organisations are now adopting wellbeing as a practice for staff to get the best out of their business. In this article, there is no reference to a causal link from good work to wellbeing. Ivan Robertson and Cary Cooper have written a book called “Wellbeing – Productivity and Happiness at Work”. The chapter summary does not indicate a strong focus on tools and approaches to improve productivity. Based on the chapter summary , there is no reference to a causal link from good work to wellbeing. 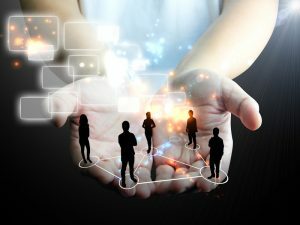 According to Iain Thompson, HR News’ guest blogger, Director of Incentives and Recognition at Sodexo Engage, there is a causal link from good leaders to engaged teams. “There’s no ignoring the importance of productivity for our economy and the effect of bad managers on employee engagement is part of the problem. The numbers prove it – teams with high employee engagement rates are 22% more productive”. This potentially takes the debate part way towards the ‘good work’ link on the basis it takes a good leader to engage teams to improve work processes. This article describes how ‘Good’ leadership includes being a good coach, trainer, and recruiter, also an expert at empowering teams. It certainly goes some way towards indicating that team engagement can stem from good work. Wellbeing or other extrinsic motivation aren’t referenced. Read it in full here and see what you think. This article does reference a causal link from good leadership (inferring good work) to wellbeing. The assumed causal link in the literature and in discussion with wellbeing practitioners is predominantly from wellbeing to productivity. I’ve been researching this article for a few months, wondering why Wellbeing programmes and Lean are regarded as two separate disciplines when they so clearly have the same objectives. Although I’m a Lean / Business Improvement coach, and not a wellbeing therapist or yoga teacher, my objectives and my business ethics are very similar. I offer tools and approaches to enhance people’s confidence, capability and culture. I strive to make work work better, because people’s health and wellbeing are are my priority. The article describes the enablers – or building blocks – that give employees these four senses. “Some are “hard” elements, such as job designs, information systems, and formal authority. Others involve “softer” aspects of organizational culture and managerial style, such as a non-cynical climate, celebrations, trust, and skill recognition”. It’s interesting that there is no direct mention of wellbeing among these building blocks. Even the softer enablers refer to the style of work, rather than to wellbeing programmes. We seem to have two schools of thought about supporting people at work, and I would like to encourage a more holistic approach by combining wellbeing therapy and programmes with business improvement. I suggest that if an employee has a calm, clear and intrinsically rewarding working environment, the right sort of leader, tools and approaches, this can result in deep and sustainable employee wellbeing. To further my interest in aligning good work and wellbeing to achieve a more holistic approach, I’ve signed up to some Wellbeing practitioner groups in the East Midlands and hope to explore my thinking with them. If you are interested in exploring the potential for good work to cause wellbeing, please contact me on info@losethebox.co.uk or on 07824 660120.